I’ve blogged before on how you can use PowerCLI to replicate some of the functionality of VMware’s SRM to easily recover VMs in a business recovery site with replicated storage. In my previous post I had only looked at the VMware side of the automation and so it’s time for an update to include the important part of handling the underlying storage. I’m going to use NetApp storage as an example but any storage vendor that exposes their API to Powershell can be used if you can find the relevant commands. This is where the awesomeness of Powershell really comes into its own when you can combine automation for both VMware and NetApp in a single script. After my previous post about vCenter availability I thought I should expand on some other factors related to availability and what you should be thinking about to protect your business against failure. Too often IT solutions are put in place without properly considering what could go wrong and then people get suprised when they do. Sometimes the smallest things can make the biggest difference and you can land up with your business not operating because some very small technical glitch that could have been avoided brings everything down. Planning for failure should be a major part of any IT project and the cliche is certainly true, “If you fail to plan you plan to fail.” Planning for failure includes big things like a full site disaster recovery plan but also includes small things like ensuring all your infrastructure components are redundent and you don’t have any single points of failure. I’ve been meaning to write this post for ages and its been gnawing at my brain for months begging to be written so grab a big cuppa and settle down for a long one! vCenter in my opinion is now the major weakness in VMware’s software lineup. Unfortunately it is that big fat single point of failure that just doesn’t cut it any more in terms of availability. Lets think back to when VirtualCenter as it was then called was unleashed on the world in 2003. At the time it was the wonder application that connected your ESX servers together allowing the game changer that was VMotion. You could easily provision VMs from templates, monitor your hosts and VMs and generate alerts. The VMware SDK was what allowed the building of PowerCLI, one of the best powershell examples out there. The VMware management layer was born. Since then Virtual Center became vCenter and until probably some time last year this was all good. It was a great single pane of glass to look at and manage your virtual environment, hosts, clusters, resource groups, DRS, vMotion, HA etc. It didn’t need to be highly available. If vCenter went down vMotion and DRS would be affected and you wouldn’t be able to provision new VMs but your underlying VMs running on the hosts would not be affected. HA was configured in vCenter but the information was held on the hosts so even if vCenter failed HA would still be able to recover VMs in the event of a host failure. Now the situation is very different, there are more and more VMware management products that rely on vCenter. Have a look at the VMware Management Products picture in the VMware Virtualization and Cloud Management solutions overview. That’s a lot of applications that now rely on vCenter and this doesn’t even cover everything. Beware, Linked Mode can delete your vCenter permissions and licenses! VMware released a new KB article yesterday with some more linked mode recovery steps. Linked mode issues can be pretty painful to troubleshoot and the resolution can cause you to lose vCenter information….so read on and be prepared! So, what is linked mode if you are not aware? Linked mode is a great feature of vCenter that allows you go connect separate vCenter instances together and share information. When you log on to any of the linked vCenter servers with your vSphere client, you are able to see the inventory of all the vCenters which is really useful. You are also able to use the search box in the top right corner and search for VMs across all your vCenter servers which is very useful when your environment grows. Users don’t need to remember a list of different vCenter servers to connect to. License information is also shared between linked vCenter servers so you can have a single license key applied in one place and use the license count for any server in any vCenter instance. Roles are also shared between vCenter servers so you can use and manage the same role across your enterprise and set permissions based on those roles. VMware uses Microsoft’s Active Directory Application Manager (ADAM) which is a cut down version of Active Directory which applications can use to replicate information in the same way as AD. My previous post talked about the design of BR and how to script a simple and scalable recovery process for getting as many VMs as you need from a primary site to a BR site when using NFS storage. When using iSCSI storage it is slightly more complicated as you can’t use one of the benefits of NFS in presenting a read only datastore to ESX hosts in your BR site and having your VMs in the inventory and ready to just power on. Rescan the storage on the ESX hosts in the recovery site to pick up the now-visible LUN. 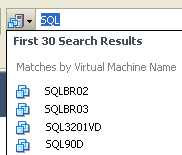 Power on the VMs and answer the UUID question that they have moved. Thanks LucD who has two great versions of a function for importing .VMX files, much better than the old community extension method. The function is very powerful so it’s worth keeping as a link for using elsewhere.